This article is about the biological species often called "scampi". For other uses, see Scampi (disambiguation). Nephrops norvegicus has the typical body shape of a lobster, albeit narrower than the large genus Homarus. It is pale orange in colour, and grows to a typical length of 18–20 centimetres (7–8 in), or exceptionally 25 cm (10 in) long, including the tail and claws. A carapace covers the animal's cephalothorax, while the abdomen is long and segmented, ending in a broad tail fan. The first three pairs of legs bear claws, of which the first are greatly elongated and bear ridges of spines. Of the two pairs of antennae, the second is the longer and thinner. There is a long, spinous rostrum, and the compound eyes are kidney-shaped, providing the name of the genus, from the Greek roots νεφρός (nephros, "kidney") and ops ("eye"). Nephrops norvegicus is found in the north-eastern Atlantic Ocean and North Sea as far north as Iceland and northern Norway, and south to Portugal. It is not common in the Mediterranean Sea except in the Adriatic Sea, notably the north Adriatic. It is absent from both the Black Sea and the Baltic Sea. Due to its ecological demands for particular sediments, N. norvegicus has a very patchy distribution, and is divided into over 30 populations. These populations are separated by inhospitable terrain, and adults rarely travel distances greater than a few hundred metres. 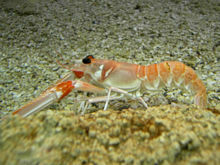 Nephrops norvegicus adults prefer to inhabit muddy seabed sediments, with more than 40 percent silt and clay. Their burrows are semi-permanent, and vary in structure and size. Typical burrows are 20 to 30 centimetres (8 to 12 in) deep, with a distance of 50 to 80 centimetres (20 to 31 in) between the front and back entrances. Norway lobsters spend most of their time either lying in their burrows or by the entrance, only leaving their shelters to forage or mate. Nephrops norvegicus is a scavenger and predator that makes short foraging excursions, mainly during periods of subdued light. They feed on active prey, including worms and fish, which they capture with their chelipeds and walking legs, and food is conveyed to the mouth using the anterior walking legs, assisted by the maxillipeds. There is evidence that Nephrops norvegicus is a major eater of jellyfish. Nephrops norvegicus is the host to a number of parasites and symbionts. A number of sessile organisms attach to the exoskeleton of N. norvegicus, including the barnacle Balanus crenatus and the foraminiferan Cyclogyra, but overall Nephrops suffers fewer infestations of such epibionts than other decapod crustaceans do. In December 1995, the commensal Symbion pandora was discovered attached to the mouthparts of Nephrops norvegicus, and was found to be the first member of a new phylum, Cycliophora, a finding described by Simon Conway Morris as "the zoological highlight of the decade". S. pandora has been found in many populations of N. norvegicus, both in the north Atlantic and in the Mediterranean Sea. Individuals may be found on most segments of the lobster's mouthparts, but are generally concentrated on the central parts of the larger mouthparts, from the mandible to the third maxilliped. The most significant parasite of N. norvegicus is a dinoflagellate of the genus Hematodinium, which has caused epidemic infection in fished populations of N. norvegicus since the 1980s. Hematodinium is a genus that contains major pathogens of a wide variety of decapod crustaceans, although its internal taxonomy is poorly resolved. The species which attacks N. norvegicus causes a syndrome originally described as "post-moult syndrome", in which the carapace turns opaque and becomes highly pigmented, the haemolymph becomes milky white, and the animal appears moribund. Other parasites of N. norvegicus include the gregarine protozoan Porospora nephropis, the trematode Stichocotyle nephropis and the polychaete Histriobdella homari. The typical life span of N. norvegicus is 5–10 years, reaching 15 years in exceptional cases. Its reproductive cycle varies depending on geographical position: "the periods of hatching and spawning, and the length of the incubation period, vary with latitude and the breeding cycle changes from annual to biennial as one moves from south to north". Incubation of eggs is temperature-dependent, and in colder climates, the duration of the incubation period increases. This means that, by the time hatching occurs, it may be too late for the females to take part in that year's breeding cycle. In warmer climates, the combined effects of recovery from moulting and ovary maturation mean that spawning can become delayed. This, in turn, has the effect of the female missing out a year of egg carrying. Adult male Nephrops norvegicus moult once or twice a year (usually in late winter or spring) and adult females moult up to once a year (in late winter or spring, after hatching of the eggs). In annual breeding cycles, mating takes place in the spring or winter, when the females are in the soft, post-moult state. The ovaries mature throughout the spring and summer months, and egg-laying takes place in late summer or early autumn. After spawning, the berried (egg-carrying) females return to their burrows and remain there until the end of the incubation period. Hatching takes place in late winter or early spring. Soon after hatching, the females moult and mate again. During the planktonic larval stage (typically 1 to 2 months in duration) the nephrops larvae exhibit a diel vertical migration behaviour as they are dispersed by the local currents. This complex biophysical interaction determines the fate of the larvae; the overlap between advective pathway destination and spatial distributions of suitable benthic habitats must be favourable in order for the larvae to settle and reach maturity. The muscular tail of Nephrops norvegicus is frequently eaten, and its meat is known as scampi. The N. norvegicus is eaten only on special occasions in Spain and Portugal, where it is less expensive than the common lobster, Homarus gammarus. N. norvegicus is an important species for fisheries, being caught mostly by trawling. Around 60,000 tonnes are caught annually, half of it in the United Kingdom's waters. Besides the established trawling fleets, a significant number of fleets using lobster creels have developed. The better size and condition of lobsters caught by this method yield prices three to four times higher than animals netted by trawling. Creel fishing was found to have a reduced impact on the seafloor, require lower fuel consumption, and allow fishermen with smaller boats to participate in this high-value fishery. It has therefore been described as a reasonable alternative to demersal towed gears, and the allocation of additional fishing rights for this type of take has been suggested. Discards from Nephrops fishery may account for up to 37% of the energy requirements of certain marine scavengers, such as the hagfish Myxine glutinosa. Boats involved in Nephrops fishery also catch a number of fish species such as plaice and sole, and it is thought that without that revenue, Nephrops fishery would be economically unviable. Nephrops norvegicus was one of the species included by Carl Linnaeus in his 1758 10th edition of Systema Naturae, the starting point for zoological nomenclature. In that work, it was listed as Cancer Norvegicus, with a type locality of in Mari Norvegico ("in the Norwegian sea"). In choosing a lectotype, Lipke Holthuis restricted the type locality to the Kattegat at the Kullen Peninsula in southern Sweden (56°18′N 12°28′E﻿ / ﻿56.300°N 12.467°E﻿ / 56.300; 12.467). Two synonyms of the species have been published – "Astacus rugosus", described by the eccentric zoologist Constantine Samuel Rafinesque in 1814 from material collected in the Mediterranean Sea, and "Nephropsis cornubiensis", described by Charles Spence Bate and Joshua Brooking Rowe in 1880. As new genera were erected, the species was moved, reaching its current position in 1814, when William Elford Leach erected the genus Nephrops to hold this species alone. Seven fossil species have since been described in the genus. Populations in the Mediterranean Sea are sometimes separated as "Nephrops norvegicus var. meridionalis Zariquiey, 1935", although this taxon is not universally considered valid. ^ C. Bell (2011). "Nephrops norvegicus". IUCN Red List of Threatened Species. Version 2011.2. International Union for Conservation of Nature. Retrieved January 1, 2012. ^ a b c d Lipke B. Holthuis (1991). "Nephrops norvegicus". FAO Species Catalogue, Volume 13. Marine Lobsters of the World. FAO Fisheries Synopsis No. 125. Food and Agriculture Organization. ISBN 978-92-5-103027-1. ^ a b c d e f g h i j k l m Mike C. Bell; Frank Redant & Ian Tuck (2006). "Nephrops Species". In Bruce F. Phillips (ed.). Lobsters: Biology, Management, Aquaculture and Fisheries. Wiley-Blackwell. pp. 412–461. doi:10.1002/9780470995969.ch13. ISBN 978-1-4051-2657-1. ^ a b c d "Norway lobster - Nephrops norvegicus". Biodiversity and Conservation. Marine Life Information Network. Retrieved December 1, 2010. ^ Alan Davidson (2002). Mediterranean Seafood. Ten Speed Press. ISBN 978-1-58008-451-2. ^ "Nephrops norvegicus (Linnaeus, 1758)". AdriaMed. Food and Agriculture Organization. ^ B. I. Dybern & T. Hoisaeter (1965). "The burrows of Nephrops norvegicus". Sarsia. 21: 49–55. doi:10.1080/00364827.1965.10409560. ^ H. J. Thomas & C. Davidson (1962). "The food of the Norway lobster Nephrops norvegicus". Marine Research. 3: 1–15. ^ C. J. Chapman & A. L. Rice (1971). "Some direct observations on the ecology and behaviour of the Norway Lobster Nephrops norvegicus using different methods". Marine Biology. 10 (4): 321–329. doi:10.1007/BF00368092. ^ C. J. Chapman; A. D. F. Johnstone & A. L. Rice (1975). H. Barnes (ed.). The behaviour and ecology of the Norway lobster, Nephrops norvegicus. Proceedings of the 9th European Marine Biological Symposium. Aberdeen University Press. pp. 59–74. ^ J. C. Early. "Processing Norway lobsters". Food and Agriculture Organization. Retrieved March 18, 2007. ^ Sci Rep. 2017 Dec 12;7(1):17455. doi: 10.1038/s41598-017-17557-x. Direct evidence of an efficient energy transfer pathway from jellyfish carcasses to a commercially important deep-water species. Dunlop KM1,2,3, Jones DOB4, Sweetman AK5. ^ Dunlop, Kathy M.; Jones, Daniel O. B.; Sweetman, Andrew K. (2018). "Scavenging processes on jellyfish carcasses across a fjord depth gradient". Limnology and Oceanography. 63 (3): 1146–1155. doi:10.1002/lno.10760. ^ a b c d e Grant D. Stentiford & Douglas M. Neil (2011). Grant Stentiford (ed.). "Diseases of Edible Crustaceans". Journal of Invertebrate Pathology. Diseases of Nephrops and Metanephrops: a review. 106 (1): 92–109. doi:10.1016/j.jip.2010.09.017. PMID 21215358. ^ Peter Funch & Reinhardt Kristensen (1995). "Cycliophora is a new phylum with affinities to Entoprocta and Ectoprocta". Nature. 378 (6558): 711–714. Bibcode:1995Natur.378..711F. doi:10.1038/378711a0. ^ Robert Bradley Jackson (2002). "The richness of life". The Earth Remains Forever: Generations at a Crossroads. University of Texas Press. pp. 15–62. ISBN 978-0-292-74055-6. ^ Matteo Dal Zotto & M. Antonio Todaro (2008). G. Relini (ed.). "La checklist della flora e della fauna dei mari italiani: Cycliophora" (PDF). Biologia Marina Mediterranea. 15 (Suppl. 1): 178–181. ^ Matthias Obst & Peter Funch (2006). "The microhabitat of Symbion pandora (Cycliophora) on the mouthparts of its host Nephrops norvegicus (Decapoda: Nephropidae)". Marine Biology. 148 (5): 945–951. doi:10.1007/s00227-005-0131-1. ^ Marisa Sabatini & Jacqueline Hill (2008). "Norway lobster - Nephrops norvegicus". Marine Life Information Network. Marine Biological Association of the United Kingdom. Retrieved March 4, 2018. ^ "Lobster research at IMR". Norwegian Institute of Marine Research. Retrieved February 14, 2011. ^ N. Bailey (1984). Some Aspects of Reproduction in Nephrops. Shellfish Committee Document CM 1984/K:33. International Council for the Exploration of the Sea. p. 16. ^ A. S. D. Farmer (1975). Synopsis of data on the Norway lobster Nephrops norvegicus (PDF). FAO Fisheries Synopsis No. 112. Food and Agriculture Organization. pp. 1–97. ^ Diego Pazos (September 15, 1995). "Spain Annual Seafood Report". American Embassy, Madrid. ^ "Nephrops norvegicus". FAO: Fisheries Global Information System (FIGIS). February 26, 2004. ^ Leocádio, A. M.; Whitmarsh, D.; Castro, M. (2012). "Comparing trawl and creel fishing for Norway lobster (Nephrops norvegicus): Biological and economic considerations". PLoS ONE. 7 (7): e39567. Bibcode:2012PLoSO...739567L. doi:10.1371/journal.pone.0039567. PMC 3405070. PMID 22848357. ^ "ICES Advice on fishing opportunities, catch, and effort: Greater North Sea Ecoregion" (PDF). ICES. ^ T. L. Catchpole; C. L. J. Frid & T. S. Gray (2006). "Importance of discards from the English Nephrops norvegicus fishery in the North Sea to marine scavengers". Marine Ecology Progress Series. 313: 215–226. Bibcode:2006MEPS..313..215C. doi:10.3354/meps313215. Archived from the original on 2008-05-30. ^ Ivor Clucas (1997). "A study of the options for utilization of bycatch and discards from marine capture fisheries: 9.1.2 Nephrops". FAO Fisheries Circular. No. 928: FIIU/C928. ^ Carl Linnaeus (1758). "Cancer". Systema Naturae (10th ed.). Stockholm: Laurentius Salvius. pp. 625–634. ^ L. B. Holthuis (1954). "С. S. Rafinesque as a carcinologist: an annotated compilation of the information on Crustacea contained in the works of that author". Zoologische Mededelingen. 25 (1): 1–43. ^ Charles Spence Bate & Joshua Brooking Rowe (1880). "Second Report of the Committee, consisting of Mr. C. Spence Bate and Mr. J. Brooking Kowe, appointed for the purpose of exploring the Marine Zoology of South Devon". Report of the Fiftieth Meeting of the British Association for the Advancement of Science. London: John Murray. pp. 160–161. ^ William Elford Leach (1830). "Crustaceology". In David Brewster (ed.). The Edinburgh Encyclopaedia. 7. pp. 383–437. ^ Sammy De Grave; N. Dean Pentcheff; Shane T. Ahyong; et al. (2009). "A classification of living and fossil genera of decapod crustaceans" (PDF). Raffles Bulletin of Zoology. Suppl. 21: 1–109. This page was last edited on 16 March 2019, at 04:07 (UTC).